The goal here was to find the look and keep her cute. The original incarnations of the little goth came out a bit too old and also a bit too punk/heavy metal, but since the Goth will have an “older sister” Rocker Chick for the group, I’ll be able to use those initial rough sketches for the Rocker Girl. The Rocker Girl will probably be more along the line of a Suicide Girl — with clothes on! Once I had the face & head down, I moved on to getting the clothing right; the obligatory striped stockings, skull t-shirt, spiked wristbands, black rubber bracelets and combat boots completed the look. I especially like how the long pigtails came out for the hair. An interesting aspect of this project, developing 12 characters in a family, is keeping consistency. I have found that some characters have lent themselves to more wild exaggeration than others, and I have had to tone down the look of some of the characters which I would have otherwise gone a bit more wild with. In order to keep the overall look of the group I have had to sacrifice some stylistic choices. It’s a great experience and process as I have been coming up with variations of characters that I might not have other otherwise pursued. 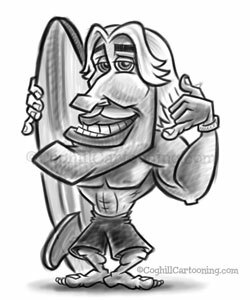 A good example of this is the Surfer Dude cartoon character sketch I worked up initially for the client to kind of get the ball rolling and for the client to make sure I could deliver a style that worked for his vision of the project. Eventually the Surfer Dude will be replaced with a more “Trendy Cool Guy” character, and the body will need to be updated to allow for uniformity in the overall character group design. I love how the Surfer Dude came out overall, but the proportioning that works for him doesn’t usually work with female characters, or with a businessman or Dad character. I’ll need to tone down the eventual “Trendy Guy” from the initial Surfer Dude style. Once I had a basic template for an adult male, and adult female and a child I used those as reduced transparency layers in Photoshop as templates to work on scanned rough sketches for newer character in order to keep facial and body proportions consistent. The entire series is initially roughed out on paper, scanned into Photoshop and then sketched, edited, resized and tweaked to complete the final finished rough sketch. Normally I will work on the head and body as separate layers in order to allow resizing later on to get proportions correct. this is awesome!! im free handing it for a project! or teacher said we could draw anything!! I LOVE IT!!! Good job!!!! Thanks! Glad you enjoy the artwork. Hi george i love your work could you please draw me a little girl with long brown hair in plaits and really pretty. Hi George i love you work could you please draw me a little girl with long brown hair in Plaits and really pretty it is for my littlr sisters birthday her name is Georja she is turning 1.
this is so cool !!! !could you please draw me a little girl with long brown hair in Plaits and really pretty it is for my littlr sisters birthday her name is Georja she is turning 1.
i think that it is so cool!!!!!! !could you please draw me a little girl with long brown hair in Plaits and really pretty it is for my littlr sisters birthday her name is Georja she is turning 1. Glad you enjoy the artwork! Sorry to say I am usually quite busy with client projects so I can’t take requests like this — but I am sure your sister would love to have artwork created by you for her birthday. Hi I love your drawings!! @Meghan – Thank you! Glad to hear you enjoyed the artwork. Very very cute artwork. :] I’m an artist myself. I love this work. Its very, very well put together. If ya’ could help with some tips that’d be great. Thanks alot. Great work! Sincerly, Vicky. @Vicky: Thanks for the kudos! Let me know in the comments here what sort of tips you’d like to see, I’d be glad to post what I can to help. man, u mentioned everything the old punks wear, but goth is all about the ugliest crap u can find, and the most 18th century stuff u can find. just think of actual goths… the European barbarians. but still… GREAT PIC!!!!! Wow , i love your art work your amazing! When did you start drwing ? I’m designing a business card and while looking for images for it, came across this one of yours: Goth Girl cartoon character sketch. 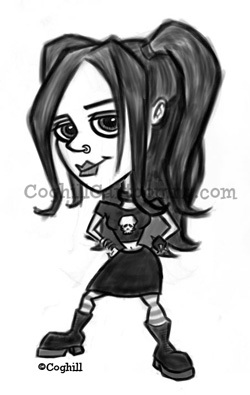 In the article from 2007 (http://coghillcartooning.com/273/cute-goth-girl-cartoon-character-sketch/), it says that you were developing this character with others for a client. Was that project ever completed? I would be interested in purchasing it if it was not or if you have similar stock items to purchase, I would be interested in seeing those. I’m looking for an image for advertising for a business I’m developing and love this one! your cartoons are cool dude!!!!!!!!!!!!!! !